Business Name: Superb Internet Corp.
Superb.net is a US hosting company with more than 20 years of experience. It is now headquartered in Hawaii. It provides a full range of services related to the hosting industry. They are trusted by such clients as the United Nations, the World Health Organization, and similar agencies. The connectivity consists of 11 core network sites that are located in five different states of the US. Superb.net provides innovative, industry-leading technologies and strives to meet individual and organizational needs. They have many awards like Dedicated Server Hosting Award, Managed Hosting Award, and Most Popular Backup Host Award for 2009 and others. The company provides Price Match Guarantee, which means that if you find another comparable hosting company selling a dedicated server with the same characteristics but for a better price, you can request the review and maybe get the server for the more beneficial price. The provider offers 3 shared hosting plans: Grid-Lite, Grid-Pro, and Grid-Max. The plans are available for 1, 3, 6, 12, and 24 months. Domain registration and so on. There are emails, numerous phone numbers (US & Canada as well as international) and a contact form. 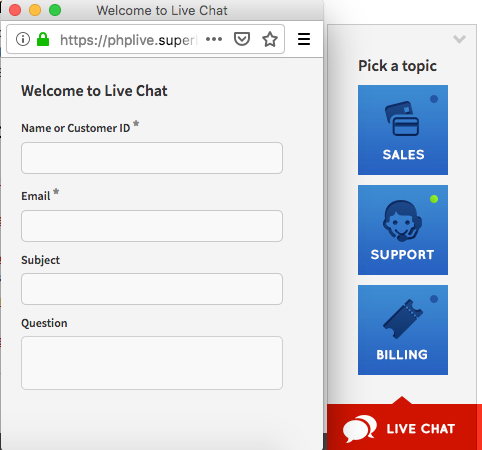 A live chat only accepts messages (and is not technically live). It also seems that only existing customers can reach it because “Name or Customer ID *” is required for any type of chart here. Here was one of the worst performance results we got in 2018: 1.3 HRank and #238. Uptime chart reveals mostly 100% uptime with a period of ~72% downtime it September. However, this wasn’t the major reason for such a low rank. Such performance resulted in a decreasing tendency in websites in 2018. Judging by the provider’s results we can hardly recommend it.